Jennie Bennett, A Writer's Journey: Movie Remakes! I'm not a huge movie buff. I like movies, I don't get to see them as often as I would like. But I'm not one of those people who analyzes the in outs of movie trends, etc. I focus 100% on story. I only say this so that you know my choices are my opinion and you don't have to agree. I love Audrey Hepburn. Give me Roman Holiday, My fair Lady, and Charade and I'll make a day out of it. But Sabrina just fell flat for me. The ending was vague and kind of abrupt. The Harrison Ford version on the other hand... Wow! Talk about a griping romance. It's a movie that will forever be one of my favorites! Okay, so this isn't really a remake, more an extension of a series. But, I didn't think it was possible to take one of my favorite hero's and ruin him so completely. This movie did just that. If you ever get the chance to see it, run away screaming, or gouge eyes out. Seriously, any choice would be better than this. I don't see movies that often, either, to the point where I've never seen any of the ones you listed here, despite having heard of them! I remember hearing others say how sucky Superman Returns was, though, so I'm not surprised to see you list that as your worst! 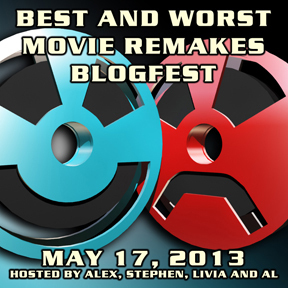 I'm not a movie fanatic either, but I managed to post something for the Bloghop! I'll be honest, I don't know much about the movies you've mentioned. Both of those movies are on several lists today! Oh man, that Superman remake was awful! Good pick. 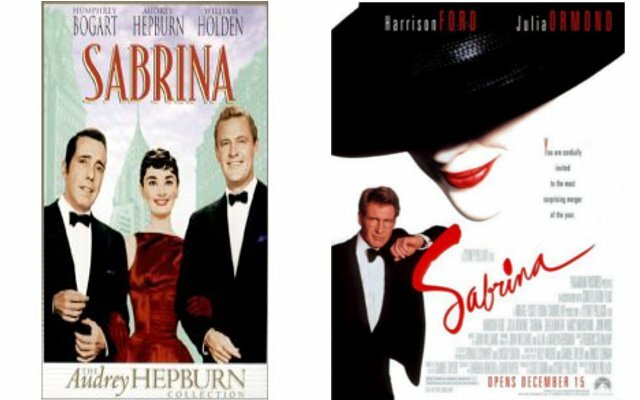 I've never seen Sabrina, and that's insane! It's right up my alley! I have to agree with Sabrina. The remake is better, no matter how much I love Audrey Hepburn. I think Sabrina is my favorite remake too. So so good. I actually liked Superman Returns, oh well. But it could have been better, I'll admit that. Never saw either version of Sabrina but glad you enjoyed it. Hmmm. I don't know if I could pick a favorite superhero movie! The early Superman films, X-Men 1 and 2, Spider-Man 2, Batman Begins and Dark Knight are all wonderful. My family has always made fun of me for this, but I love Superman IV: The Quest for Peace. Maybe it's not as awesome as I remember it as a kid, but my adult self still really likes the theme of seeking universal peace. I'm in the minority that kinda liked Superman Returns lulz. I guess I just kind of liked the story and how it connected with the old movies. Great pick on the movies! Superhero movies are like asking nerds to expound on the virtues of linux: it's likely to end with a technicality. Which is to say that I have really terrible taste in movies. I love the really bad ones. For instance, I really enjoyed the Green Lantern movie despite its completely terrible nature. I liked the X-men movies (all of them, actually, even with all the problems in first class). But my very favorite superhero movie isn't really a superhero movie: KungFu Panda. I've seen Superman Returns in one other worst remake list. Brilliant minds and all that. I chose Sabrina, too. The original was great but Bogie never cut it for me while Harrison did. Great choices, Jennie. I love Superman, too, and was disappointed myself. It was okay...just could have been much better. 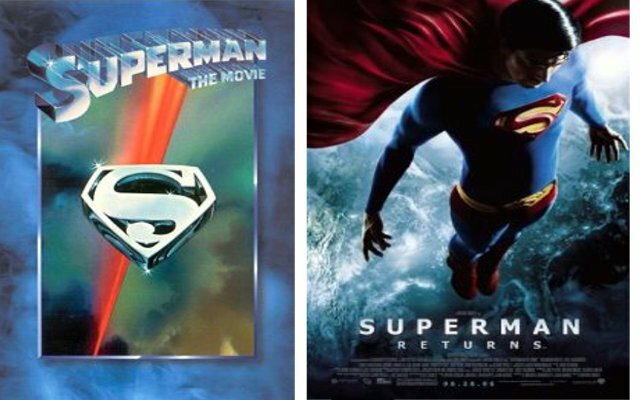 Here's hoping Nolan's influence will make the next SUPERMAN reboot a success. I sure hope they add something new to the story, though; between TV and film, it's been done SO many times already. I didn't see the Superman remake. I'm hoping for something better for the new release. I love this. Sabrina was your best and my worst. At least we each liked one of them. And it was so awesome seeing you at Storymakers! Ah, seriously one of the best weekends ever. Ooooooh I so agree with your Sabrina choice. I LOVED the remake and I own my own copy of it. Haven't seen Superman, unfortunately. I have seen Sabrina on both lists tonight, although I have never seen the movie. Now I want to rent it. Friday Night Alibi - Cover Reveal!